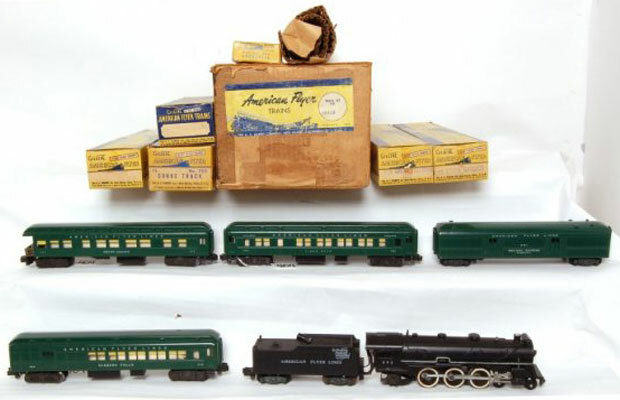 In the knuckle coupler era of the 900-Series cars, between 1953 and 1959, Gilbert made ten train sets that had both New Haven style cars and Pullman Heavyweights. #K5328 Meteor Steam Passenger Train made in 1953. #953 Heavyweight Combination Car, #952 Heavyweight Coach Car, and #954 Observation Car. #706 Remote Control Uncoupler, #690 Track Terminal, and #4B transformer. #K5345W Trail Blazer Steam Passenger and Mail Train made in 1953 & 1954. #690 Track Terminal, and #708 Air Chime Whistle Control. #2H306 Trail Blazer Steam Passenger and Mail Train made in 1953 was the same as the #K5345W. #121 sold in 1955 was the same train again, marked down to reduce unsold inventory. #K5422T Mountaineer Steam Passenger Train made in 1954. 2 #955 New Haven Coach Cars, and a #952 Heavyweight Coach Car. #706 Remote Control Uncoupler, #690 Track Terminal, and #1-1/2 transformer. #K5436T Meteor Steam Passenger Train made in 1954. #952 Heavyweight Coach Car, and #954 Observation Car. #120 sold in 1955 was the same train, marked down to reduce unsold inventory. #5555W New Pacemaker Passenger Set made in 1955. #690 Track Terminal, and #710 Steam Whistle Control. 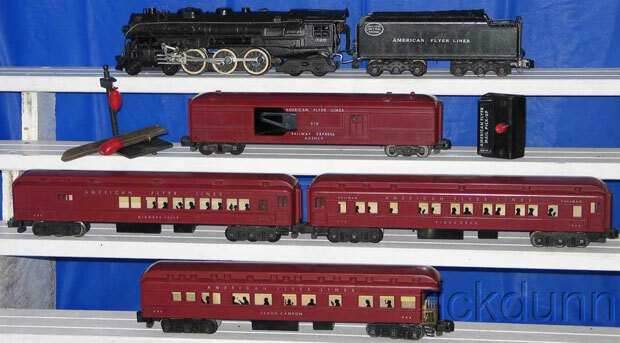 #20145 Action Passenger Train Set made in 1958 & 1959 was the updated #5555W New Pacemaker. #978 Operating Brakeman Observation Car (in a box numbered 25039). #26704 Manual Uncoupler, #26690 Track Terminal, and #22020 transformer. In 1959, the set also included a #23786 Talking Station.